Diego offers a discount of 50% on their first / introductory lesson! I am a friendly, experienced and highly enthusiastic piano teacher looking for students in and around Wandsworth. I recently gained BMus and PG Cert. degrees in piano performance from the London College of Music, where I frequently performed in concerts as soloist and ensemble partner, and participated in masterclasses with renowned concert pianists such as Charles Owen, Bryce Morrison and Krassimir Taskov. I have been teaching students of all ages and abilities for over 7 years; preparing them for graded exams, upcoming performances or events, or simply for personal development and enjoyment. I have successfully entered students for graded exams up to grade 8. 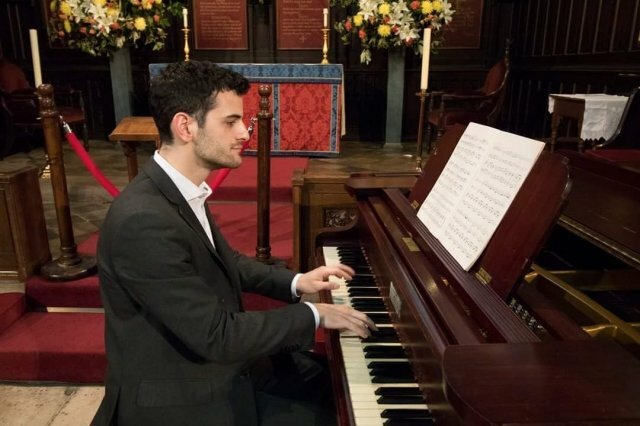 DiegoFrom Julia (5/5): Diego is an amazing piano teacher, we are very lucky to have found him. My son is enthusiastic about him. He explains very well, he listens, he praises and encourages. Thank you! DiegoFrom Meera (5/5): My daughter has recently started piano lessons with Diego and he has been brilliant. He has a lovely manner and I have no hesitation in recommending him to anyone of any age wanting to learn. He is also always punctual and has enthused my daughter enough for her to voluntarily practice every day! DiegoFrom Jane (5/5): My 9 year old daughter really enjoys her piano lessons with Diego - his style of teaching makes it fun and relaxed while at the same time, keeping her attention and encouraging her all the way through. He is a great teacher! DiegoFrom Vik (5/5): Diego has been great for my son's piano tution. He has energised it and given explanation and deep understanding for pieces he plays - Great. We continue our music journey for my son with Diego's teaching.